Come to the St. Gianna for Peace. Come to thank God for all the Blessings He showers upon you and your family. Come with your needs, petitions and problems. Come and you will feel refreshed, strengthened, and better able to deal with life’s challenges. 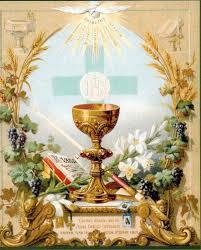 Our Risen Savior Jesus Christ, fully present in the Blessed Sacrament, is waiting there for you. He is not looking to judge, but to heal! His arms are opened wide to give us His Merciful Love, which is beyond all understanding. At St. Gianna the Blessed Sacrament is exposed for Adoration every Wednesday at 7:00 p.m. during a Holy Hour (First Wednesday of the month) and the Prayer of the Miraculous Medal. Also, during the Parish 40 Hours of Adoration, celebrated during the month of October, we look for Adorers to commit to a particular amount of Adoration time each day. You do not have to be a member of the St. Gianna to visit the Blessed Sacrament and sign up to be with our Lord. Additional adorers are always welcome.